WoTC, December 2017: "We got rid of Duel Decks for good!" WoTC, August 2018: "Well, not so fast..."
To anyone interested: GRN cards are cards from Guilds of Ravnica set which makes this product even closer to Duel Decks as we used to know them back then. Blast, no card names from Guilds available. I mean, 2-player starter kits predated the Duel Decks product line anyways, and they also had stuff like clash packs come out before the product was retired. The end of the product line never did mean the end of 2-in-1 decks. Is it me or do the dice look different, with sharper edges? They may be mockups though. Probably mockups, they have done 3D graphics dice in product shots before. I remember one time the numbers vere even mirrored, which is kind of impressive. I'm glad to see this kind of product return, a set of two decks meant to be played against each other is something that absolutely should be in their product line. It's like a Duel Deck except the cool identities of "Elves" and "Goblins" you get more generic identities like "red-white" and "black-green". The decks seem to be less themed mechanically as well, and are all the cards standard legal? I guess this is a lot more similar to clash packs than DD, which is disappointing, but better than nothing. Maybe they will be cheaper? These are way worse than Duel decks. Who exactly thought this would be a good idea ? I think it's a good intro product for new players who want to learn how to play, but don't have a local game store nearby to play at. It's also affordably costed for newer players ($14.99) and gives players a few decent cards that they can use for future decks or for trade fodder. I think this is a good product all around. No 4-ofs and no overarching theme = no consistency, no consistency = poor gameplay, poor gameplay = losses. It's terrible that Wizards is telling new players, metaphorically "It's okay if you're a loser! As long as you play, that's all that matters!". This thing has no saving graces. Just pay $15 for the two cards of monetary value and be done with it. Dude it's $4 worth of cards plus wathever Ghalta ends up costing after this reprint. Thank god we are getting colossal dreadmaw reprint. I was so scared when we didn't get one in commander 2018. I had to increase my heart medication. Trade fodder? These cards are the ones people leave on the table after draft is over. The only vale card here is ghalta and that propably only because wizards felt bad by also putting a rare pelakka wurm here. I just noticed there isn't a specific expansion symbol here, so any connection to duel decks will not/cannot be traced back if one were to take apart the deck for singles. Is this a good thing or a bad thing? Well, I guess in hindsight, some cards lose their value or don't live up to the potential of the original printing if they have a special set symbol. So I guess it's a good thing for the reprints. Ghalta, Primal Hunger is currently around the 7 dollar amount and going down, but sees play in Standard. Reclamation Sage is a multi-format card that shows up in Modern and EDH. Demanding Dragon is a speculative target to replace Glorybringer in possible red decks after rotation. Llanowar Elves sees play in Elves decks in multiple formats (Standard, Modern, Legacy). Ravenous Chupacabra is a solid creature kill spell that has seen some play in Standard. This is a product that has been lacking in paper magic for quite awhile. A pre-constructed deck that can introduce players to the game and have a guide to help players learn the game by themselves. 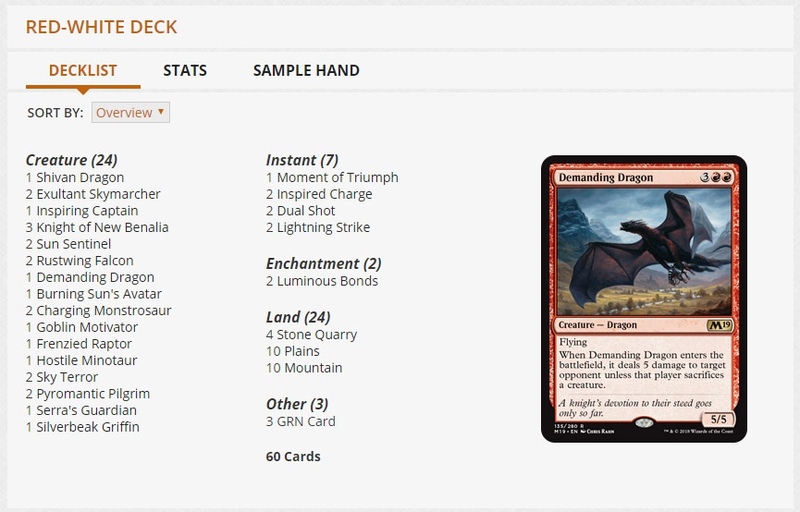 They have this on MTG Arena and Pokemon online. It's not the ideal way to learn to play, but it's an option for those who want to learn with a friend who also doesn't know how to play. Imagine that you and a friend are new to MTG and you so happen to stumble into a local game store. The amount of products are large and plentiful for new players that they don't know what they are looking for. Where do you start? -Does the employee tell you to wait for open house to learn? -Does the employee tell you to buy a Commander pre-constructed deck? -Does the employee give you a free welcome deck? -Does the employee try to sell you the Planeswalker decks? -Is the employee even able to tell you how to play Magic? All of these answers are possible. This product can be an on ramp for new players to learn. Is this a product for everyone? No. Is it meant for us established players that post about it online? No. There are products out there that aren't meant for everyone, but it doesn't mean that they are bad. This product can be an on ramp for new players to learn. Is this a product for everyone? No. Is it meant for us established players that post about it online? No. There are products out there that aren't meant for everyone, but it doesn't mean that they are bad. The amount of product for presumed newbie players is staggering. Welcome decks are free and full fill the purpose of teaching the basics. For anything else, you can just dive into booster packs right away or build a deck. This product is a waste of cardboard as it simply does not provide anything that the welcome decks dont do for free. The cards in the packs are bad, literally the only card worth anything is Ghalta, and even that is a stretch (in EU the cards just barely 3€ and there are plenty of promo versions, way more than people that would build a deck with the card). Anyway, it could be worse, but just because it could be worse, this product does not win any prices and its simply a "bad" product for all intents and purpose. Any newbie player is much better served simply getting welcome decks, even slamming together a bunch of welcome decks (like 4 of the same color) will build for a much better deck for a newbie, and thats totally free, 0$, cant beat that. How did you stumble onto Magic? (I started playing during Onslaught when a friend showed me Magic at the college lunch room while I was playing Yu-gi-oh. I bought a Yu-gi-oh deck from Target.) Most people learn Magic from other friends or people around them. But how do you get the MTG product out there for FRESH new people, who don't have friends who play MTG? For a new player that has never been to a local gaming store, how do they play Magic? Where will they find product? How are they able to play the game out of the box with a friend for a low price. Welcome decks are for stores to get new players hooked to the game. If your game store is just giving 4 or 5 of them away to a single player, then they are doing it wrong. They are to be played with and used for teaching new players. How would you describe a "bad" product? One that does not have financial value? One that does not appeal to you? One that does not do what it was intended to do? 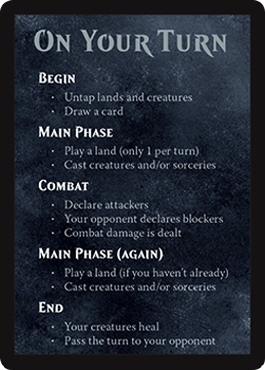 They use to have beginner decks like these in the past, with a preconstructed way of playing the game to allow players to learn the basic mechanics. It's a necessary product to have for new players. Remember, this is for new players who don't know where to go to by mtg products, other than at Wal-Mart or Target. These are not supposed to serve as a gateway into Standard. They're essentially the old theme decks, except with a more general theme (colors) and in a 2-in-1 package so that it's easier to get a newbie friend to play with you. I find it hilarious how many people are acting like Wizards is doing terrible mistakes whenever a product not intended for them gets released. There literally is nobody that knows "nobody" that already plays magic and starts playing magic in paper form. The vast majority is introduced by a friend that already plays, or they are multiple people that buy stuff at a store and see other players. In any case of that, you wont use this product for teaching a new player. If someone starts to play magic because they see it online (or back in the day of console mtg games) , that indeed brought people into stores that started by playing the digital game , especially as the games themselves promoted to play at stores (and later even provided a store-locator in the game itself). Paying 15$ for this product is a waste of money, theres simply no ground to justify the existence of this product, with the countless other "newbie" friendly decks you could buy. I rather give a player a commander deck, which has many different cards and mechanics for them to explore. If someone wants to play the game, the curiosity of exploring the game is the spark to start, finding other people to play with is just as important, nobody plays paper magic with nobody to play with ; in that case you either play digital or just collect cards. Anyway, if someone wants to start playing, stores provide free decks. Its not like they give out so many of them (as no other player other than total newbies is remotely interested in the welcome decks). Give them one of each color to explore, thats the point of them, they might open and play in the very same store right away. Stores i know give away welcome decks regularly each week to parents that buy other toys in the store, or parents that want to introduce children to the game with the most basic decks they can get their hands on (in the local language of cards even, as most have english cards, if your children dont speak or read english, you need some special products just for that, welcome decks do all of that, for a grand total cost of 0$ , its unbeatable for what it does, and no other newbie product has to exist at all ; if you learned the very basics you are totally set to start building your own decks, they will be bad of course, but thats absolutely normal). Still, the vast majority of people will have someone around them that already plays the game or a store to play at, with people that already know the game. Thats the norm, and this kind of product here is terrible for a stores, nobody buys this stuff and everyone that does is almost guaranteed to be screwd over by the store (as some stores might go the dark path of not telling or giving out free welcome decks, as they rather sell 15$ decks to a newbie player, which is just another problem of this kind of product). If someone truly believes this product has any reason to exist, fine, i whole heartily believe its among the biggest waste of product you can produce, failing entirely on its purpose and even hurting it, as a newbie will have a bad feeling spending 15$ for what is worth about nothing. In terms of value, i would recommend everyone to buy a commander deck, they easily justify their cost and provide much more different cards and value of play (and most importantly, they can literally just slam every card they like in the deck and play with it, and slowly upgrading it, which works quite perfectly if people start out with different commander decks). What is the MSRP on these? Who do they think is going to buy this. This is even worse than the duel decks, looks like a random pile of cards. I miss the days when they actually made decent premade decks that had a cohesive theme. Citation needed. The way you're taught and the way others are taught are 2 different ways. You assume everyone is introduced to Magic in the same way and that it's some sort of "insider's club" where the only way you learn is from someone who already knows the game. Why can't there be people who don't know the game of Magic? There has to be someone out there who doesn't know someone who doesn't know, right? If your theory is true, then this would be a wasted venture for WoTC, but since they created this product, plus with Mark Rosewater even stating that the product is becoming harder for newer players to learn the game due to complexity (New World Order) this doesn't align with what you are inferring. But seriously, if it's not for you, don't buy it. If you think this is a waste of money, you should see the Welcome decks at Target and Wal-Mart that they sell for 10 bucks. You only get 2 30 card welcome decks and 2 spindown dice. THAT's a waste of money! 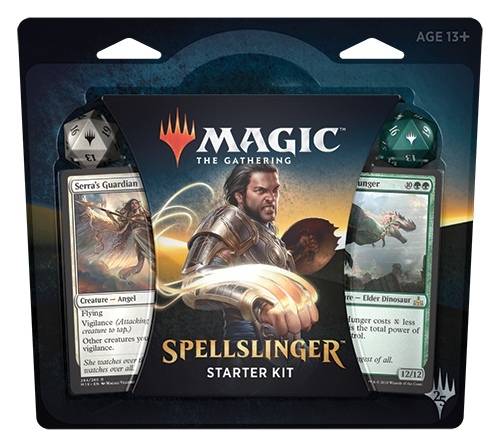 The Spellslinger "Duel Deck" is a shining gold nugget over that monstrosity of a product. *Also, there is another rare in this deck that's from Guild of Ravnica that hasn't been revealed yet (since one deck has 5 rares and the other has 4 rares, and they make these things symmetrically) so there might be some more value inside these as well. I'm not saying that this is the greatest thing out there, but it's something that needs to exist for people to purchase. I missed out on the fun the first go around. It'll be nice to see these go down a bit. I'm not trying to be confrontational about this but I would argue that word of mouth is a lot stronger of a tool than this kit may be. You even said that you were introduced to the game during college by friends. I was introduced to the game by my cousin who also taught my brother in law. My very first game of Magic was with the Venser deck (I can't remember what my cousin or brother in law played but it wasn't the Koth deck) of Venser vs Koth and I won after I blew up the field with Sunblast Angel. I then got my sister into it and sometimes my nephew. So in a way, my cousin generated four new customers to Magic. Now let's say out of the current player base, we each brought three to four new players to the game. That creates a system of growth that sustains itself. I just think that out of all the tools that they've been trying lately they seem to be missing the greatest asset that they have to bring people into the game, us. I will wait to pass complete judgement until I see what the Guilds of Ravnica cards are. I loved the preview duel decks and was sad when they stopped doing them. The product offers more value than the equivalently-priced opening of four random boosters. The deck is affordable enough to compete with similar Pokemon products. It's not filled with valuable standard-legal cards, avoiding being savaged by enfranchised players ripping the product for cards. They also provide the decks pre-sorted so that the first game can be played as a guaranteed proper game with back and forth and gradual introduction of mechanics. Also known as allowing people with magic connection to be recommended the product by the store owner without having to already know someone who plays magic. Also known as fulfilling the stated need of being an entry product. And hitting the exact problem that has been repeatedly stated in this very thread by nay-sayers: that currently the only way to learn magic is to know someone who already plays. Now, as an exercise to open your mind, try selling your used copy of Monopoly. See how much value you get by opening a Monopoly. People don't buy a new game for its resell value.